Angle of Attack - Flap Bias? FLAP BIAS ... WHY? WHEN? Plain flaps, split flaps, and slotted flaps at high AoA do not incur significant Coefficient of Lift shifts (of CLmax to a lower AoA at near-stall) from the basic wing section, but wide-span Fowler-type flaps can and often do. Even though wide-span Fowler flaps are only rarely installed on light aircraft, it is interesting to understand the issues. "Flaps are auxiliary controls built into the wings and used to increase the camber. Flaps may be on the leading or the trailing edges. Tra iling edge flaps reduce the stalling angle ... when referred to the chord line of the original nonflapped airfoil. Flaps permit aircraft to fly at a lower speed, permitting better control on takeoff and a lower approach speed for landing. Flaps also increase drag, permitting aircraft to descend at a steeper [approach] angle. There are various kinds of flaps, such as splits, fowlers ... and slotted." 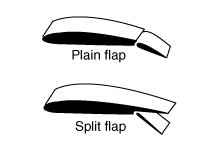 "Slotted flaps [are a] type of trailing-edge flap. These may be single, double, or triple slotted. They form a slot(s) between their leading edge and the inside of the flap well in the wing. The resultant airflow helps to control the boundary layer, resulting in higher maximum lift but not so much increase in drag." "Fowler Flaps [are a] type of trailing edge flap that moves out of the wings on tracks. These flaps increase the wing area, the chord, and the camber and help in boundary-layer control. They provide maximum additional lift. Fowler flaps are commonly used [we add: True...but almost always in the complex wings of heavier aircraft] but have a complicated mechanism." "A true Fowler flap does not simply rotate about an external hinge; it always slides or rolls on tracks or is carried by some sort of complicated parallelogram linkage, and its hallmark, during deployment, is an initial period of moving more or less straight aft with little change of incidence. The upper surface of the wing is unbroken to the trailing edge, or close to it, and the flap does not begin to deflect in earnest until its own leading edge is under the trailing edge of the wing." Accordingly, for installation of the Alpha System AoA on the occasional Fowler flap-equipped LIGHT aircraft that we are discussing, we believe that incorporating flap bias may well be a good idea. What makes a Fowler unique is its effect on making the wing area significantly bigger. To do that, the system really needs that hinge and flap track sticking out of the bottom of the wing that we see on most jet transports. That hinge point and flap track sticking down there---about 4 or 5 inches and maybe a little aft of the flap seam---makes the flap go considerably aft on tracks and then go down, increasing the wing area as well as opening a slot. This graph is from the superb book “Aerodynamics for Naval Aviators” by Hugh H. Hurt. It's heavy going in places, but every aviator really ought to have a copy. Note the AoA shift of CLmax to ~10deg.Alpha of Fowlers compared to the nearly-identical ~14deg.Alphas of the basic section or plain or split flaps. A shift of 4deg.Alpha is a big shift. As we were writing this page, we consulted a few friends. The well-known aviation writer Peter Bedell (a Baron owner) noted: "[Whether a light aircraft's flap is truly a Fowler or not] is a gray area...For example: The Baron's flaps do go aft and they do increase wing area as Fowler flaps do. This is done by a clever track/roller system in the wing and flaps themselves that guides them aft and then down as Fowlers should. I believe the Bonanza through King Air use the same system. I don't know how much aft travel there must be to define a "Fowler flap". I was led to believe that it was any flap that increases wing area. "So I rummaged through the house and found a few airplane manuals. My Cessna 182 manual says 'single-slot type wing flap.' The Cessna 172 manual, which is an identical wing to the 182, says: 'The flaps are slotted and incorporate a degree of Fowler action over the first 10 degrees.' We own a 172 and they do, in fact, extend aft a bit while going down. The Beech Travel Air manual says 'single-slotted Fowler flaps.' The Travel Air wing is identical to the Baron's, I believe, although most Travel Airs and early Barons had flaps with a longer chord...."
Pete Bedell also sent us the quote above from Peter Garrison at Flying Magazine and he concludes: "Based on Garrison's statement, I'm thinking the Baron's flaps are single-slotted and incorporate a degree of Fowler action like the 172 manual states. Beech's Travel Air manual says they are Fowlers but the term is obviously tossed around loosely and that line could have been written by a technical writer who was not an engineer. The two Baron manuals I have don't even mention the type of flap used." Our Marine test pilot (a Bonanza owner) Colonel Al Aitken ends it up with: "I think the main effect of the use of a Fowler type flap is the occurrence of the wing’s higher CLmax at a lower AoA compared to that of a slotted, plain, or split flap on the same wing. For that effect to be noticeable, the flap needs to travel aft significantly enough to increase the wing area considerably. It appears to me that is not the case with any of the airplanes mentioned. 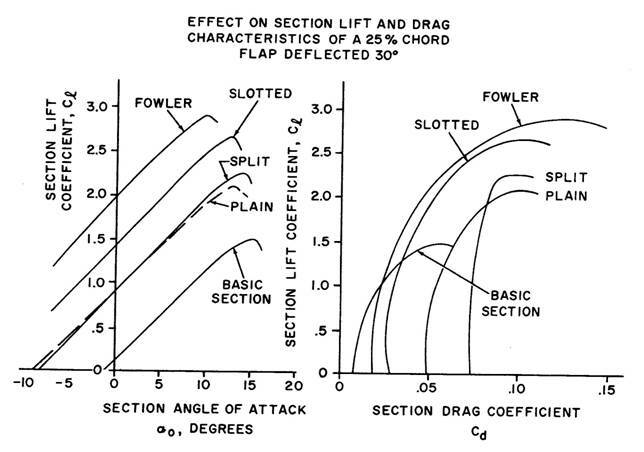 "Technically, the King Air's, Baron’s, Travel Air's, Bonanza’s, and Cessna 182/172’s flaps can be considered Fowlers…but the typical effect of the Fowler that design engineers of heavy airplanes try to achieve (that being: significant chord extension with added camber) is not being achieved in these light general aviation designs…and need not be. "That’s why I think we are safe considering them all to be 'de facto' plain or slotted…and more importantly, considering them all to achieve their slightly higher-than-clean CLmax at about the same AoA as clean." I'll only add that after flying my Bonanza 36 for ~2,000 hours with the lovely little SC-100 AoA (sadly, it's no longer available) from Safe Flight Instrument Corporation as a secondary early warning of stall indicator...that's the same as what I observed. I never noticed any need for flap-bias at all. ADDED LATER, in Spring 2017: A few years after this explanation was written, the manufacturer asked us to flight-test a newly-developed Flap-Biasing module.